Over the past few weeks, our Design for America team has made a different type of progress in our ongoing research in the state of community and education in the Harlem community. When we started off, much of the difficulty of moving forward was in organizing all of our thoughts and goals effectively. We had no lack of ideas — we could talk about education for a sustained three hours every Monday night without a problem — but the weeks passed, and we soon found ourselves having actually created little despite having thought of a lot. 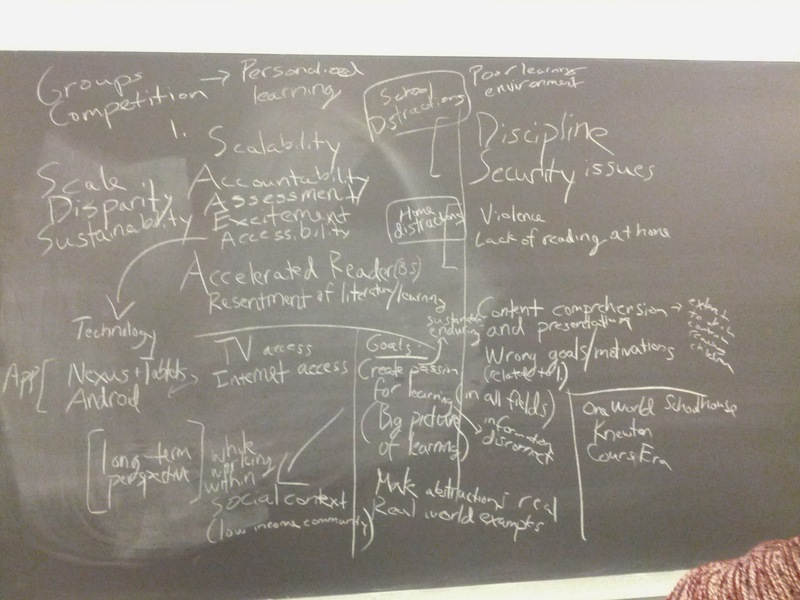 The white board after our first meeting — all kinds of ideas, idealism, and potential. We had researched for weeks and discovered all sorts of useful information, but we could go on doing this for months — eventually, we had to converge on some more precise goals and directions forward. Looking back at the pages of research and piles of sticky notes, we converged on a few common themes and narrowed down our target audience and goals. Gaps in reading and literacy as a result of environmental disadvantages consistently came up in our research, parent-student-teacher communication and relationships were regularly found to be critical to early childhood development (parent-student relationships especially affected the child’s later emotional and educational success), and all of this started to set in at an early age, so we decided to focus on elementary school children in the younger end of the K-6 spectrum. Our proximity the Harlem community and Columbia’s messy history with its residents made it our ideal environment to work with. Now we had a more concrete plan to improve the relationships and interaction between parents, students, and teachers centered around reading, hopefully improving literacy rates and fostering a love for reading in the process. Looking back, the process of refinement began when we started to question and remove our assumptions. The more speculation and hypotheticals we had, the more thinking and research was being done into another semi-related topic — we could go down all sorts of rabbit holes forever had we kept at it. Eventually, the continuing expansion of the theoretical and speculative aspects of our sessions became counterproductive in the ultimate goal of actually implementing something. What allowed us to focus on something specific was simply getting out into the community, visiting libraries, talking to teachers, reaching out to outreach groups, and filling in our unknowns. In some sense, this validated some of our previous research and thought, but it was even more useful in simply letting us know what we shouldn’t focus on. Removing the extraneous left us free to discover and focus on the underlying core ideas of our project. Of course, this is a constant work in progress, and given the amount of change we’ve seen in the last month alone, it’s to be expected that our implementation and ideas continue to adjust as we learn more and interact with the community at large. I suppose in the design process, we’re learning how to learn, too.